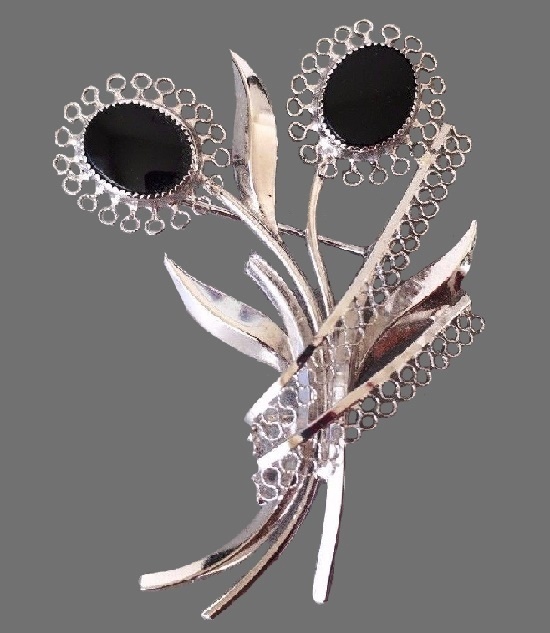 Created by Alexis Bittar jewelry – fantastic shining world, where exotic flowers and animals, ethnic ornaments and classical motifs easily coexist. Bittar began acquaintance with the fashion world in 1983, when he got a job as a seller in a New York vintage clothing and jewelry store. Fascinated by Art Deco, René Lalique glass, Bakelite, lucite, semiprecious stones and metals, Alexis created his first jewelry collection (1988). Meanwhile, his work began to bear fruit, especially, when Bergdorf Goodman, the fashion director at the department store, noticed him. Subsequently, Bittar developed jewelry lines for such famous companies as Saks Fifth Avenue, Harrod’s, Barneys New York, Burberry, Takashimaya, and more. Besides, he created decorations for the Cooper-Hewitt Museum and London Victoria and Albert. Noteworthy, the designer opened his first boutique in New York (2004), and the same year his decorations appeared in Estee Lauder advertising. Amazing jewelry marked “Goldette” undoubtedly catches the eye and makes the heart beat faster! Its sophistication, magnificence and style are truly amazing! An incredible combination of colors, textures, materials and craftsmanship – all this speaks of the decorations of the company “Goldette N.Y.”. Meanwhile, the history of the company began in 1955, thanks to its founder Ben Gartner. The owner of the trading company “Circle Jewelry Products Company”, he launched a line of exquisite jewelry under the brand name “Goldette N.Y.”. Noteworthy, the production of Goldette jewelry took place in Rhode Island, but the jewelry design was developed in New York. 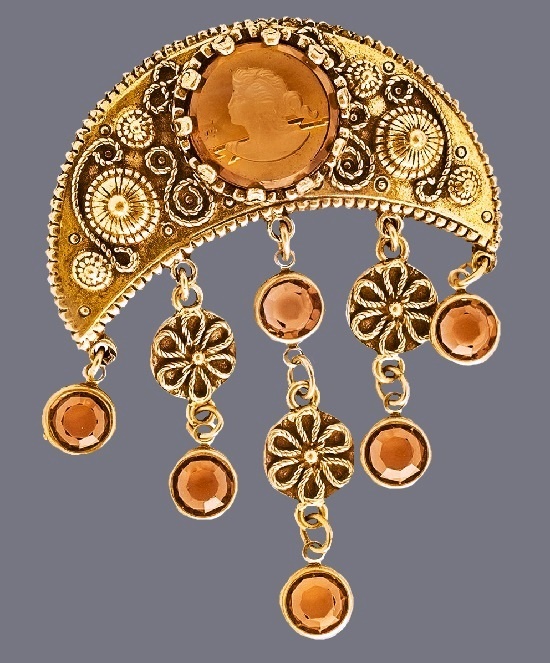 Traditionally, Goldette jewelers used jewelry alloys of silver and gold tones, as well as alloy of beautiful antique color, known as Russian gold. In addition, complemented design with handmade cameos made from natural shells, intaglio with genre scenes, legionnaires’ profiles and neat female heads. Also, Austrian crystals of high quality, art glass, rhinestones and cabochons. 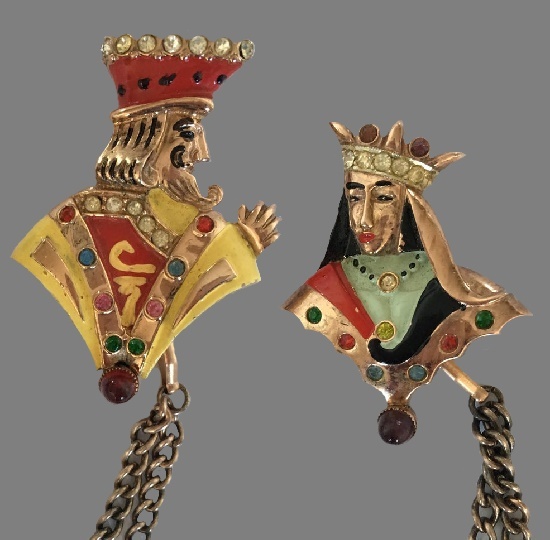 To develop a unique style, Goldette N.Y. jewelers used the best traditions of jewelry art of the time. For example, gorgeous Art Deco and Art Nouveau decorations, or decorations in the style of the Victorian era. Mandle brand jewelery, produced in limited editions and executed with the highest level of craftsmanship, is undoubtedly a valuable acquisition for vintage jewelery collectors. According to sources, the founder of the jewelers’ dynasty, Urie Mandle emigrated to America from Germany in the early 1920s. First, he began working as a salesman for the E. Cohn & Company, later renamed Cohn and Rosenberger, and then Coro. In the mid 1930s Urie Mandle joined Lisner, which at the time produced watches, gifts, hat pins, beads, etc. The task of Urie was to launch a line of jewelery in collaboration with local manufacturers. Prior to this, most Lisner jewelry was produced by European partners, in particular, Whiting and Davis made bracelets for Lisner. Noteworthy, Urie Mandle left Lisner and founded his own company – Urie Mandle Corporation (1938), which began to specialize in the manufacture of costume jewelry. Meanwhile, for four years, the company has achieved unprecedented success, collaborated with the largest stores and became one of the most famous in its industry, after Coro. Robert Mandle, the son of Urie, also joined the family business, leaving a higher paying job of the film director. There is very little information about American jewelry company which produced costume jewelry marked SFJ. However, there are lots of beautiful vintage decorations marked SFJ, mostly brooches created in 1970s. Traditionally, the main inspiration for SFJ jewelry – Christmas, Halloween, and St. Valentine’s Day holidays. 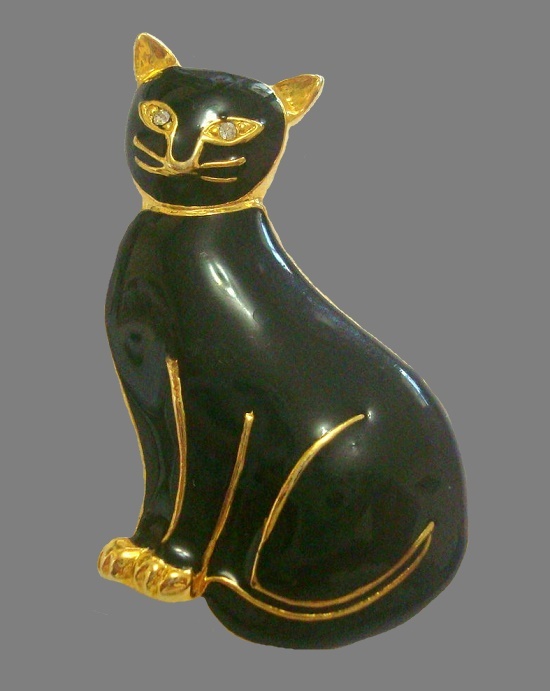 Besides, the common feature of all jewelry pieces – gold tone jewelry alloy, or brass, and enamel of bright colors. According to some sources, abbreviation SFJ means Stephen’s Fine Jewelry. However, other sources mention SFJ as the trademark for R Steinmetz & Sons, the American company registered in Mumbai. Also, some sources mention the third person, whose original initials were S.F. and after the jeweler got married, she added the letter “J” to her label. And I would be very grateful for any additional information about SFJ jewelry brand history. 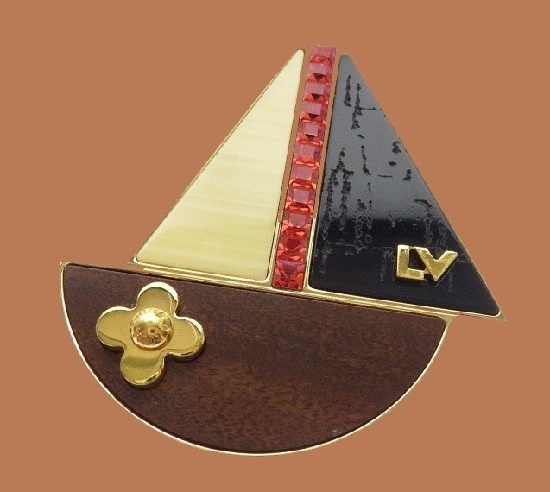 The world famous brand Louis Vuitton, as you know, began producing jewelry in 2001. Thus, it is impossible to call any jewelry of this brand vintage. In addition, the high price of jewelry makes the concept of “costume jewelry” not compatible with the Louis Vuitton brand. Indeed, each product – a brooch, bracelet or necklace, reaches hundreds and thousands of dollars. Thus, it is not vintage costume jewelry, but high fashion jewelry, and, according to the Louis Vuitton brand itself, high jewelry art. The use of precious metals and precious stones – garnets, emeralds, tourmalines, topazes, pearls, as well as traditionally manual work by jewelers also determines the price of products. Traditionally, each piece is labeled with a LV monogram, the main talisman of the world famous brand Louis Vuitton. Clear art deco graphics are adjacent to the smooth lines of the quatrefoil – the iconic leitmotifs of Louis Vuitton. 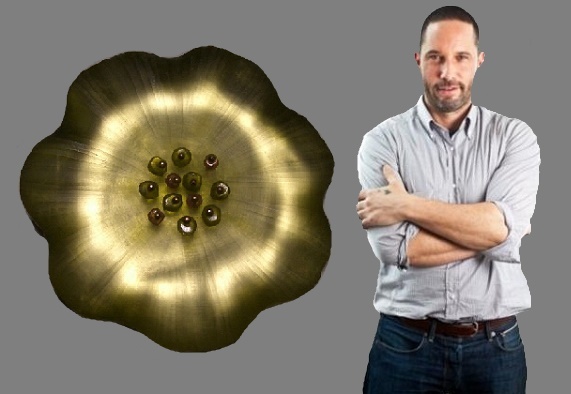 Talented Belgian decorator, Christopher Radko became famous mostly for the design of Christmas tree decorations. He founded his company in 1985, satisfying his own need for collecting intricate, expensive and “unnecessary” things. Meanwhile, by 2003 Christopher Radko’s annual cash flow reached as much as $ 50 million! Noteworthy, “early Radko” prices on the secondary market can reach up to $ 1000 for one Christmas tree decoration! Both, “mere mortals” and world-scale stars prefer his decorations. In particular, Elton John, Oprah Winfrey, Robert Redford, Kim Basinger, Elizabeth Taylor, John Travolta, Robert de Niro, Barbara Streisand, Arnold Schwarzenegger and others. Having mastered the production of high-quality Christmas-tree decorations according to old sketches, the designer began producing costume jewelry. First, it was the Christmas theme, and then limited edition copies of well-known ornaments that Christopher himself liked. 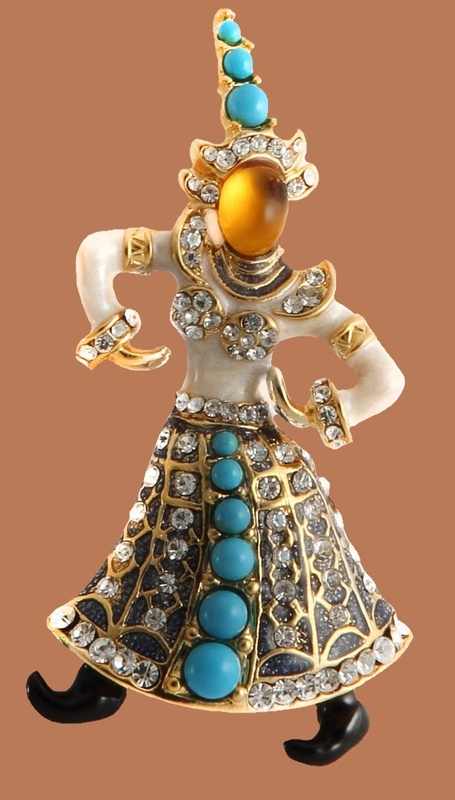 In particular, the “Siamese Dancer” – the famous brooch by Marcel Boucher, produced in various versions. First of all, there is very little information about the company producing costume jewelry under the Star Art brand, that is, it is practically absent. And it is very strange, given the high quality and filigree work of these vintage decorations. The confirmed by time quality – indeed, the rare Star Art sparkling decorations have survived to our days. They are unusually beautiful and have retained their original look. Meanwhile, these products are more than half a century old! In fact, the American Star-Art company existed for about 40 years – from the 1940s to the 1980s. As a rule, Star art masters used sterling silver (indicated on the stamp on the reverse side), sometimes with gilding, or with a wired coating that gives silver strength and prevents oxidation. An important element of each product is filigree details made of sterling silver. Also, by all means an abundance of transparent crystals or, and multi-color rhinestones. Traditionally, the Star art motif of costume jewelery is floral and leaf patterns, bows, hearts, and classic curlicues. Finally, all Star Art products are rare and desirable for vintage jewelry collectors.